In Hebrew culture, which was primarily rural in nature, children were considered a blessing. They helped out on the jobs. Sons were trained up by their father in the family trade. Hebrew worship involved festivals that were practical (eg building of shelters during the feast of booths) and family based. Worship too involved the whole family dancing in circles. Teaching of scriptures was primarily story based oral traditions that involved the whole family in the retelling. The extended family lived together or near each other and so children were used to being in the company and talking with their elders. However, as our “enlightened” industrial culture the parent(s) go out to work separate from the children and so the children spend less time being with them. As we pursue our careers away from home children are more of an inconvenience to our lives than a blessing. Thank God for schools that replaced the family training, they can now spend most of their day with their own age group and us adults with our age-group. Furthermore we have moved away from our parents so we and the children spend less time talking and learning from their elders. We too are cut off from those older than us. 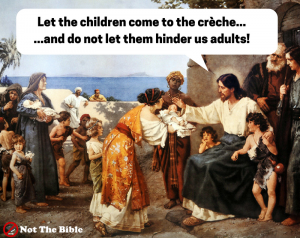 Churches have adopted this model too – the children go out to their groups with their worship and the adults remain in for their “proper” service. And I’m sure we’ve got a service especially for the older folk so we don’t have to sit through their worship. And so “family services” where we all come together are something painful and often avoided. We have lost the art of being family together, but more than that we have lost the art of receiving from all parts of the Body of Christ because we have segregated ourselves into our little homogeneous groups. As such we adults can’t learn what God has to say to us through our children or our elders and we are diminished as we no longer see the full image of Christ any more. “Let the children come to me” has been reduced to a cute phrase where we imagine them blessed by Jesus and sent off so we can get down to the real business.